Jonathan, Jerry and I drove up to Seattle this weekend to see the first weekend of the Northwest New Works Festival. Amidst the dance, theatre and music offerings on display was When You Point at the Moon, a creepy fable acted out via puppets, projections and recorded sound. The creator of this stark and surreal world is the nimble Kyle Loven, who calls the piece a cautionary tale for adults. 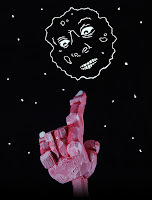 Kyle was inspired by an eastern moon myth that warns children to "never point at the moon, or your ears will be cut off." The Stranger calls Kyle Loven "a burgeoning genius," and the Seattle Times said Kyle's piece this weekend was "another dark horse coming into the light." We are thrilled to bring his work to Portland and to see how it plays out in the context of the Risk/Reward Festival. You can listen to Kyle and Portland's own Kate Sanderson Holly (who also rocked it up at NWNW!) interview each other about their respective works here. And you can watch an excerpt of his earlier work, my dear Lewis, here.